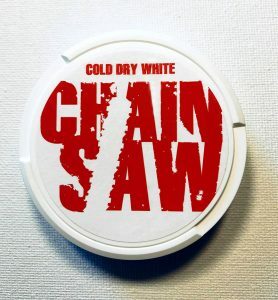 Recently released by the popular snus maker V2 Tobacco (now owned by Swedish Match), Chainsaw Cold Dry White is a form of chewing tobacco which bears many similarities to snus. 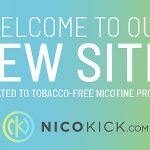 With a whopping nicotine content of 40.5mg per portion, Chainsaw Cold Dry White packs an incredibly potent punch! Every can of Chainsaw Cold Dry White comes with 15 0.9 gram portions for a total of 13.5 grams of ‘super strong’ chewing tobacco per can. Soon after opening my can of Chainsaw Cold Dry White, the first thing that I noticed was a strong peppermint aroma with slight hints of menthol in the background. 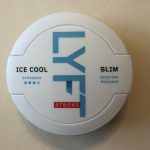 Once I tried a portion, I was quickly greeted with a sharp peppermint taste along with a cooling sensation of menthol. I found the menthol to be quite refreshing on a hot summer afternoon, and the peppermint taste paired well with the menthol. 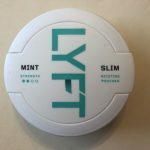 Around the ten minute mark the menthol taste began to subside, and I was left with a peppermint flavor as well as hints of salt in the background. Due to the high nicotine strength of these portions, I was unable to keep any in for longer than twenty minutes and so I’m not sure how the flavor developed past this point. However, given the direction things were heading I imagine that the peppermint would remain in the foreground but would be complimented by a salty tobacco taste towards the half-hour mark. The portions were dry and fit comfortably in my upper lip. 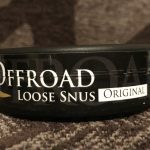 Although they are marketed as chewing tobacco bags, the portions very closely resembled snus in terms of look and mouthfeel. Despite being dry, the strength of the portions meant that I began to feel a strong nicotine buzz rapidly set in within minutes of putting in a portion. 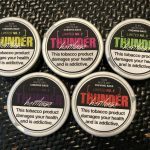 As I normally use regular strength portions (and the occasional strong portion), I found myself needing to take out Chainsaw portions around the fifteen minute mark due to the incredibly strong nicotine buzz that they produced. As a whole, I found that Chainsaw Cold Dry White was tasty, but a little bit too strong to enter my daily rotation. 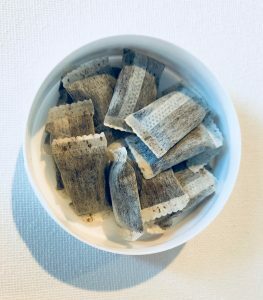 I recommend Chainsaw Cold Dry White to fans of extra strength snus who are looking for something with an even bigger kick and don’t have access to traditional snus brands (like those living in the EU).